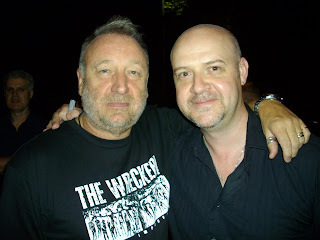 On Monday 27th September Georgina and Ken found themselves in the company of one Mr Peter Hook, after his show at The Tivoli performing Joy Division songs with band The Light. This was followed with drinks until the wee hours of the morning, chatting with members of the band including Hooky's son Jack, who was celebrating his 21st birthday. Expect photos to be added to the Schmoozing With Tycho album on Myspace soon, but in the meantime if you want some light entertainment Ken has posted a rather ranty blog about some of the criticism levelled at Hook and Co on the current tour (click on the photo at left).